This joint excursion with the Geological Society of Glasgow will examine Devonian volcanic and sedimentary rocks (including the source of the Stone of Destiny? ); and look at a variety of building stones in Perth City. We will visit Kinnoull Hill quarry, the Quarrymill Woodland Park, the River Tay at Scone and Perth city centre. To examine Devonian volcanic and sedimentary rocks (including Stone of Destiny? ); and to look at a variety of building stones in Perth City. Kinnoull Hill quarry (disused), NO 1350 2334. A90 to Friarton Bridge then A85 to Perth, then to Kinnoull Hill. A93. Return to Perth, park at South St or Canal St car park. PC World at South Gyle. Kinnoull Hill quarry (disused), NO 1350 2334. Late Carboniferous quartz dolerite dyke intruded into Devonian lava. 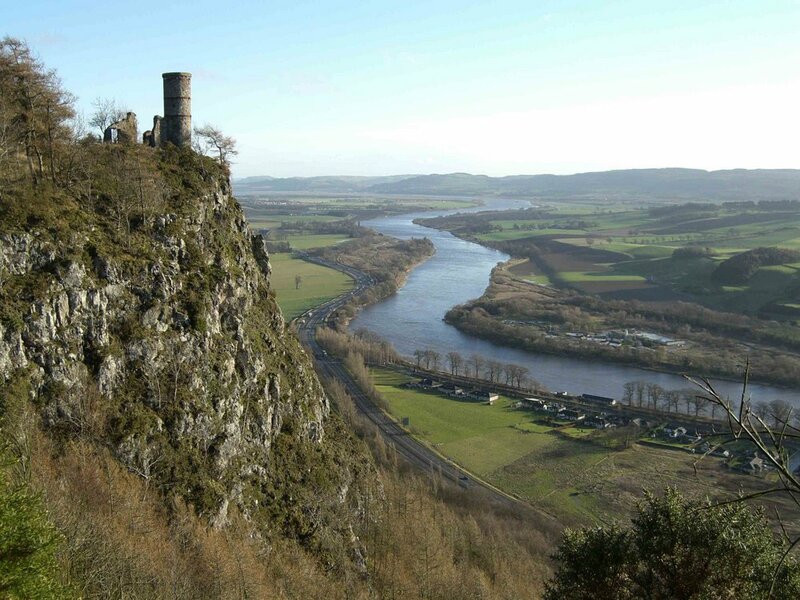 Walk up to Kinnoull Hill (waymarked footpath) 1km, 100m height gain. Quarrymill woodland park, about 1km total, flat walk; Tay at Scone river walk 2.5km total, flat, path; Perth city centre about 2km on pavements from St John’s Kirk to Smeaton Bridge-Queen’s Bridge. Grassy slopes may be slippery if wet. Town walking may have traffic hazards when crossing roads. Group must remain together; one person with high viz to take up the rear. No hard hats; leader and at least one other to have hi-viz for city walk.